If you’ve ever taught a child to ride a bike – or if you remember back to the days when you first learned – you know that the biggest obstacle to overcome is fear. It’s understandably scary to get onto a two-wheeled bike without training wheels, and even though we all know now that it’s simple as long as you keep pedaling, the concept of balancing on two wheels is quite foreign at first. The ingenious invention which helps kids overcome that fear is called the balance bike. It’s really a smart concept; the seat is lower to the ground and there are no pedals, so it really can’t legitimately be called a bicycle – there’s no cycling involved. Toddlers keep their feet on the ground as they walk or run (think Fred Flintstone); that encourages them to give themselves a good push and then concentrate on learning to balance as the bike moves, without having to worry about pedaling. If they start to panic, they just put their feet back down and everything’s fine. Once kids have mastered the ability to balance on two wheels, transitioning to a “normal” bike becomes easy. Toddlers as young as two and three love these bikes and end up riding real bikes at a much earlier age with complete confidence. Naturally, there are a lot of variables to consider when shopping for a balance bike, even more than you might imagine. They come in steel, aluminum and wood (yep, wood!) frames, the tires can be made of rubber (with or without air) or foam, some have brakes and some don’t. Some models have more adjustable seat heights than others. There are even custom and pro models, believe it or not. We’ve compiled a list of the top 5 best balance bikes for your toddler, considering all of the variables and including a nice assortment of the different types and styles of these bikes. You may a bit dubious about spending the same amount of money you’d pay for a regular bike for a model without pedals, but once you’ve seen how your kids take to balance bikes and how much easier it makes bike riding for them – you’ll wish these things were around when you were a kid. You may also take a read at our comprehensive balance bikes buying guide. Who needs Big Wheels and trikes when you can start a young toddler off with a bike? The Strider is the big boy in terms of sales and popularity when it comes to the balance bike world; it comes in three models (Classic, Sport and Pro) and all sorts of bright colors to entice your little one to climb on board and learn to ride. And we do mean little, because this balance bike is designed for riders from 18 months to five years old. We’ve chosen to review the 12 Sport because of the extra safety and comfort features on the bike, but let’s take a look at the basic construction of the Striders. It’s a given that they have no pedals, because that’s the distinguishing feature of all balance bikes. This model and the Classic have steel frames that weigh just under seven pounds, while the Pro is made from aluminum and weighs 2½ pounds less. The seat is built to accommodate toddlers’ rear ends, smaller than one you’d find on a standard children’s bike, and the handle grips are similarly downsized to make them easy for kids to hold and control. Both the seat and handlebar height are quickly adjustable (on Sport and Pro models, without a special tool) so the balance bike can grow with your child; the seat can be raised from 11 to 16 inches, and the handlebars adjust from 18 to 22 inches. One of the bonus extras on Sport and Pro models is a second, padded seat that’s more comfortable than the standard plastic one, and it’s mounted on a longer post making the bike big enough for even five-year olds to ride comfortably. The differences between Striders and regular bikes don’t stop there. The tires are made from industrial foam instead of rubber, to provide much more traction on any type of terrain and allow children to take these balance bikes off road or through puddles without any safety concerns. They’re mounted on custom-designed plastic wheels which will take a lot of abuse without fear of broken or bent spokes. It’s not all sunshine and roses, as the steel frame on the Classic and Sport models is prone to rust, something you wouldn’t expect from a “bike” that costs almost $140. Putting that aside, though, the 12 Sport is a balance bike that toddlers will want to ride all day – and they won’t even realize that they’re learning the skills needed to ride a real bicycle when they get a bit older. The Bicycoo is for toddlers who are a bit older, aimed at riders 2½ years old and above. Once they get to that age they’ll appreciate the cool looks and colors of the GT, while you’ll appreciate the strong build of this balance bike. The Joovy is heavier than the Strider, but not because of its frame which is made from sturdy aluminum and very easy for younger kids to control. The extra weight comes from the 12-inch, 2.25-inch wide pneumatic tires on plastic rims which will make riders feel that they’re on a big-boy (or big-girl) bicycle; they better simulate the experience of riding a real bike with pedals, but are best suited for use on pavement rather than on the lawn or off-road, and they bring with them the usual need for a bicycle pump and occasional patching. There’s one other “extra” on the Bicycoo, a rear hand brake which probably isn’t necessary but does give older kids experience in using a brake that will come in handy when they graduate to the real thing. There are a few drawbacks to the build of this balance bike, though. The seat can only be raised 1¼ inches, from 14 to 15.25 inches and the available handlebar adjustments are also minimal, meaning there isn’t much room to grow with the Joovy. Both adjustments have to be made with tools, unlike the easy-adjust feature of the Strider. We would consider this a balance bike useful at a very specific age range, from 2½ to 4. 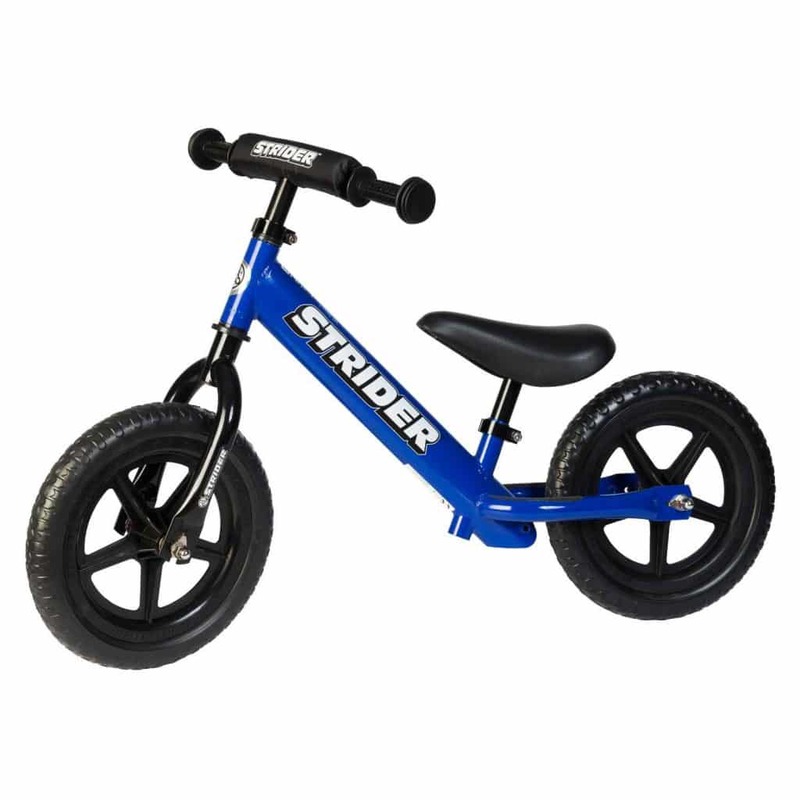 But at about $110, a much lower price than the Strider, it’s a good investment that your kids will love. If you didn’t believe us when we said there were balance bikes for toddlers made from wood, here’s the best of the bunch and it’s an eye-opener. Easy Rider has been making these bikes for years and they have a number of different models aimed at different age groups. The Easy Rider Lite is the smallest of the group, and your 1½ -3 year old will absolutely adore it. This model is made from weatherproof birch wood and has large, 12-inch pneumatic tires on aluminum rims; it’s also designed to be the star of the neighborhood cycle set with embossed flames near the handlebars, a fake leather seat, and blue or natural colors available. There’s much more to this bike, though, as the seat is adjustable from 11.5 to 15 inches (with an extended seat post available adding another 2¾ inches), and there are two steering modes. Restricted steering ensures that your youngest kids who are just learning can only ride straight, while the unrestricted setting lets them figure out how to stabilize the bike with the handlebars after giving themselves a good push. Because the frame is made from birch the Easy Rider Lite is very light, at just seven pounds. Our first thought was that a wooden product would be flimsy and easily broken, but this is a high-quality, well-manufactured product which will stand up for the long term. We didn’t expect to love it, but we did – that’s why it comes in at #3 on our list of the top 5 best balance bikes for your toddler. Expect to pay just under $150 for this bike, but also expect that your entire brood will be able to use it over a period of years. Here’s the gourmet entry on our list, with a price tag ($200) to match. The FIRSTBIKE has won all sorts of awards for its German design elements, and looks striking with its bright blue and grey appearance, but what stands out to us more are its thoughtful functionality and safety features. To start with, the frame is made from a high-tech nylon composite which absorbs shocks nicely and is completely smooth. There are no sharp edges, bolts sticking out or anything else that could scratch or scrape a young rider when they and their bike take a tumble. The seat is built in a “horse saddle” shape which holds toddlers in place by partially wrapping around their rear ends; it’s also made from an easy-to-clean gel. There’s also a restricted steering feature and a rear drum brake, and the tires are Big Apple pneumatic rubber. There’s one accessory which we recommend purchasing for younger riders: the “lowering kit” which attaches to the rear wheel axel and lets the bike sit low enough to the ground for a 1½ to 2 year old to ride comfortably. Other cool accessories are a “sled” attachment which allows your kids to use the balance bike in winter, and a basket which lets them carry stuff around and feel just like the big kids. You might want to check out a few of the other FirstBIKE models before deciding on a purchase, as their Cross balance bikes have knobby tires designed for off-road use and their Basic model is less-expensive and almost as good. “Isn’t there a high-quality balance bike under $100?” Sorry, not unless you happen to find a great sale on one. But here’s another option that comes in just over that price point. You may see this sold as the “Scamper” or with the brand name “Stampede,” but it’s the same balance bike. It’s another model that’s ideal for taking off-road, since it has thick (1.75 inch) 12-inch pneumatic tires which also add to the overall stability of the Charger. The handlebars are wider as well, making this a better choice for your older toddler. There’s a very tough composite frame with a padded seat that is again suited to taller riders, with a minimum seat height of 12 ½ inches. A very nice feature, though, are the fully-adjustable, soft handlebars which not only can be set at different heights but also tilted forward for shorter kids. There’s a rear brake, high-grade two-toned powder-coated paint for impressing the other kids at the playground – and most importantly, the construction on this bike is excellent.